HOTEL CALIFORNIA "A Salute to the Eagles" was founded with the intent of filling the void left by the demise of The Eagles in 1982. 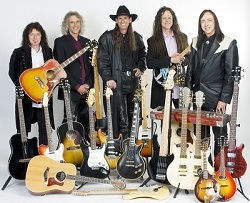 By blending their extraordinary vocal and musical talents, HOTEL CALIFORNIA faithfully and accurately reproduces the sound of the Eagles studio recordings while recreating a classic sound which undeniably transcends the boundaries of Rock, R&B, and Country while delivering a modern, action packed performance that brings this timeless music into the new millennium. This concert presents an exciting showcase of The Eagles mega-hits such as “Take it Easy”, “Heartache Tonight”, and “Hotel California” as well as newer releases “Get Over It” and “Love will Keep Us Alive”. The group also performs select titles from the solo works of Don Henley, Glen Frey, and Joe Walsh.